The Bird’s Nest Spruce, Picea abies 'Nidiformis', is a slow growing dwarf evergreen that has light green new foliage. There is usually a depression in the center of the plant, giving rise to the common name. Light green foliage on spreading branches rises up slightly with nodding tips. This spruce bears dark green needles that are much shorter and daintier than those of the typical species. Use this distinctive plant for rock gardens or as a specimen. 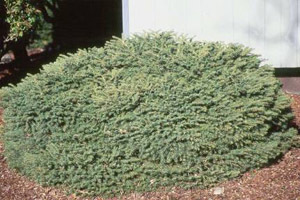 This fast growing evergreen tree is extremely hardy and wind resistant, and performs best in full sun or minimal shade. This spruce has a pyramidal growth habit when young, becoming columnar when mature. Evergreens are excellent plants for adding structure, color and texture to your yard or garden. And if you have a small area, try this one in containers for that special place in your garden or patio. This plant works well in low-maintenance gardens, make good foundation plants against buildings.